It’s the end of the year and time to turn the page after a bit of reflecting. What better way to reflect than to contrast image and reality, and even more so when the topic is Palestine’s economy? For starters, I ask, Do we have an economy, real or imagined? For a long time, many would just sweep this question under the rug of the Israeli military occupation and say No. How could we when every aspect of our livelihood is ultimately micromanaged by the Israeli government? But such a knee-jerk answer did not make sense after the Oslo Agreement and the advent of the Palestinian Authority. From that point on, the economic reality under occupation was spiced up with heavy doses of self-made artificial images. The starting image, if my memory serves me well, was that we would “build a Singapore.” May God rest that imager’s soul. I hope the real Singapore never asks Palestinians to compensate them for the damage done to its good name. These now infamous Palestinian negotiators who signed the agreement in Paris back on April 29, 1994, termed the Protocol on Economic Relations between Israel and the PLO (better known as the “Paris Protocol”), agreed to what our economy could and couldn’t do. The Paris Protocol was, with only minor modifications, incorporated as Annex V in the Interim Agreement - the equally infamous Oslo Agreement - signed in Washington on September 28, 1995. So with the Oslo Agreement, which descended like a parachute from above, emerged the agreement’s spectacular brainchild, the Palestinian Authority. The Palestinian Authority, which is its accurate name in the Oslo Agreement, wasted no time in producing all the trappings of a real economy. Before one could say “the Authority is an Orwellian double-speak Authority,” economic ministries, ministers, laws, policies, regulations, and even a few “strategic” plans started to pop up here and there. From the outset, the powers that be even squeezed the word “National” in between “Palestinian” and “Authority,” which seemed to give many people patriotic goose bumps. Anyone engaged in trying to build a real economy got little more than a permanent rash. A decade later, the Palestinian economy was in our face. The image of an economy had taken form. The superheroes were not the negotiators who signed the Paris Protocol, and not even the Audi-happy Palestinian ministers, but rather the donors and their agents who built an entire aid industry using the agreements, Paris Protocol included, as its foundation. When reality sunk in after the collapsed Camp David II talks in the year 2000, more and more people started to see the artificial economy for what it was - a farce. We were back to hearing: How could we have an economy when every aspect of our livelihood is ultimately micromanaged by the Israeli government? But then came along Israeli peace activist (and good friend) Jeff Halper and made an analogy: even a prison has an economy, albeit 95 percent of the prison is occupied (not to be confused with militarily occupied) by the prisoners. The prison warden only needs a small percent of space to control all the doors, entrances, exits, and windows. What gets traded in a prison is what the warden allows in or is smuggled in: cigarettes, drugs, books, chores, favours, and the like. This “Inconvenient Truth,” to borrow Al Gore’s words, that the whole of the occupied territory was no more than a prison where the prisoners seemingly have space, but zero voluntary ability of movement and access, was an eye-opener to many. When one added the fact that 60 percent of the West Bank was classified in Oslo as “Area C” - off limits to Palestinian economic development - many started to see a prison as a step up from the reality that was called the Palestinian economy. Then came political infighting on the heels of long overdue elections. A convenient new chapter was born to rebrand the past economic failure. For so many years, if you read the reports, listened to all the speeches, read the billboards, scanned the newspaper advertisements, noted all the prizes being offered by the banking system, you would never believe that a real economy never existed here. And just in case you started to feel that this may be an artificial economy after all, the banking system jumped out of its conservative straightjacket and started begging for customers to take out loans. Not one loan, not two, but as many as possible. Why not? - since the mighty all-knowing donors were quietly hiding behind the bank vaults, guaranteeing every move and cheering on the structural change that was taking place with full Palestinian government acceptance. Indebtedness! Good ol’ American indebtedness. Need a student loan? No problem. Need a car loan? Simple. Want to get married - how much do you need? A home? Why rent when you can own? Don’t have the latest iPhone? Don’t sweat it, just sign here and pay NIS 5 for the next 200 years. While you’re at it, every home needs a computer, what’s the difference between a NIS 5 and NIS 7 payment? And the list goes on. OK. I’m being a little too sarcastic, but not much. Let me try to bring this hallucination into focus. Back to basics! What the hell is an economy anyway? Well, the dictionary says an economy is “the system of production and distribution and consumption.” OK, that’s a decent starting point, but it reflects a normal condition. Palestine, the occupied part, is far from normal. The phase of our development is not just producing, distributing, and consuming. We are supposed to be removing the boot of an entrenched military occupation from our necks while simultaneously building a state that needs an economic foundation to serve it. Yes, we must eat, sleep, and be clothed in the meantime, but that is surely not going to be enough. So, what does an economic foundation to serve a forthcoming sovereign state need? A few more cafés? A larger supermarket? KFC? Another hotel? A bowling alley? Bars? BEEP! Wrong answer. All of those are fine and dandy to have, but they will not move us one iota closer to freedom and independence, economically. The economic resources we need are known to all who need to know, first and foremost the donor community. Strategic state-building economic resources are land, water, roads, borders, electromagnetic spectrum, airspace, movement, access, electricity, free trade relations, and the most important resource of all, the human resource. All of these and many more are not 99 percent in Israeli hands but are 100 percent micromanaged by the Israeli military occupation. Without taking a step back and taking note of the systematically planned integration (better known as forced dependence) of the Palestinian economy with Israel, we will continue to believe a reality of an economy that is simply an economy in the occupier’s defined image. The wake-up call has arrived. State or no state, this occupation is illegal and must end now. In the world of military occupations, third states, signatories to the Fourth Geneva Convention, carry the burden of holding the occupier accountable. Enough with this glorified empty talk of institution building and bilateral negotiations. Our economic resources are being raped as donor-funded cappuccinos keep the doors of our cafés open. If donors can’t place their efforts where they belong, then they should kindly be asked, by their own people before us, to stop wasting their citizens’ tax dollars by feeding us an illusion of building a Palestinian economy, which has now been exposed as the fragile house of cards it is. If our water resources continue to be diverted, if our frequencies continue to be commercially abused by unlicensed Israeli telecom operators, if our movement is going to remain hostage to an ID, a magnetic card, a businessman’s card, and a permit, if a Gazan student can’t study in a West Bank university, and if illegally annexed Jerusalem is going to remain so difficult an issue for donors to address, well then why are we all wasting our time? It seems the Palestinian “leadership” purchased its first mirror this past September and is starting to see the reflection of what it has created and thus beginning to make some slight adjustments. I would hope that not only legacy-building is in the reflection, but an honest approach to where we have reached, on all fronts. The times do not call for more resounding speeches or cosmetic changes to a warped reality. Palestine’s economic hallucination has the power to maintain an image of a reality that is growing at more than 9 percent a year. It used to take us 20 minutes to travel from Ramallah to Bethlehem. Now, we are forced to circumvent Jerusalem, around cement walls and through multiple Israeli checkpoints. Today it takes us over 60 minutes, at best. For GDP growth, this is great news. During those extra 40 or more minutes we burn more gasoline, require more lighting on the longer roads, eat more sandwiches on the way, spend more time driving, hit more potholes, which causes more work for the road engineers in the morning, etc., etc. All of this extra spending is great for a higher GDP but catastrophic for our livelihood and state-building exercise. It’s time for a new economic model, one built on economic justice, social welfare, solidarity, and sustainability. We should all have one goal in mind: lowering the cost of living under occupation so more people can remain steadfast during these troubling times. If you don’t believe me, no hard feelings - feel free to transfer your salary to that other bank down the street, they are giving away the best prize yet: one- way airline tickets for your entire family to anywhere, but Palestine. Bon Voyage! Sam Bahour is a Palestinian-American based in Al-Bireh/Ramallah, Palestine. 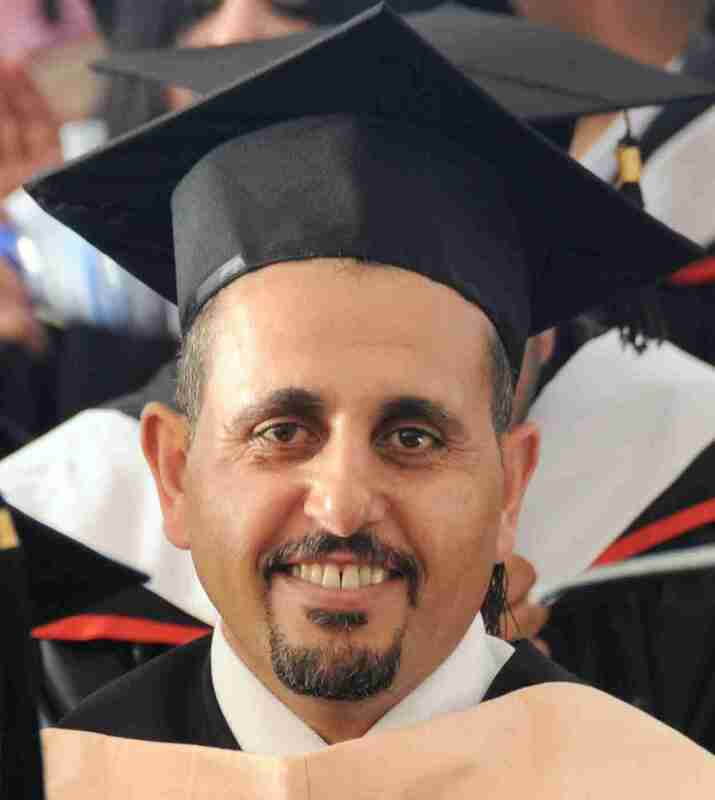 He is a freelance business consultant and was instrumental in the establishment of the Palestine Telecommunications Company and the PLAZA Shopping Center. 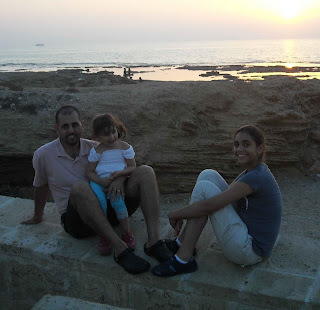 Sam writes frequently on Palestinian affairs and has been widely published. He is co- editor of HOMELAND: Oral Histories of Palestine and Palestinians and may be reached at sbahour@palnet.com . He blogs at www.epalestine.com . Israel has caught up with itself. This mess must stop for all our sakes, Israeli and Palestinian! This article is based on the forthcoming paper Institutionalizing Statelessness: The Revocation of Residency Rights of Palestinians from East Jerusalem in the International Journal of Refugee Law. Some Palestinians refuse to just sit still and accept their fate as a permanently, militarily occupied people. One would think by now that Palestinians would have received the message loud and clear – the world couldn’t care less about their fate. But no, these Palestinians just refuse to sit still. 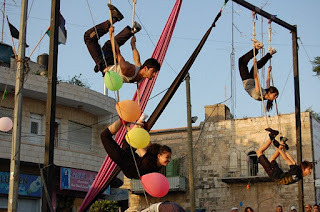 They continue to defy their reality and can be seen across the Holy Land – jumping, climbing, swinging, falling, tripping, singing, twirling, juggling, cycling, tight roping, and the like. Their nerve! To think they can attempt to live a normal life when the powers that be are spending billions, literally, to cause a collapse of Palestinian society. And who is it exactly I speak of? Palestinian clowns. No, I’m not taking a swing at the political leadership, at least not here. I’m talking about the real thing: circus clowns, like in clowns that make you laugh and make you forget that the boot of occupation is pressing on your neck. As many are bent on dehumanizing Palestinians, systematically and with contempt, others are mending the wounds of a people who have been purposely stripped of their well-being in one of the world’s most unjust chapters of history. One group tending to that process of mending the deep wounds that 44 years of military occupation continue to inflict is the Palestinian Circus School (PCS), based in Birzeit, Palestine. Yes, you read correctly. 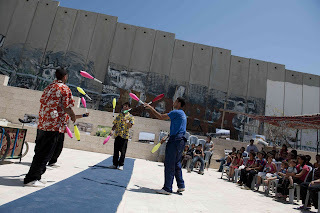 There is a Palestinian Circus School in Palestine! However, as I have learned while working closely with this professional team of circus artists, this is not what we all think of when we first think of circus. There are no elephants here, only Palestinian children engaged in a form of art and expression that uses their body to tell a story which can make audiences laugh, cry, or both. Although the school recently moved from Ramallah to its newly donated headquarters in Birzeit (thanks to Dr. Hanna Nasir), its activities are spread across the West Bank, and Gaza will be added as soon as possible. 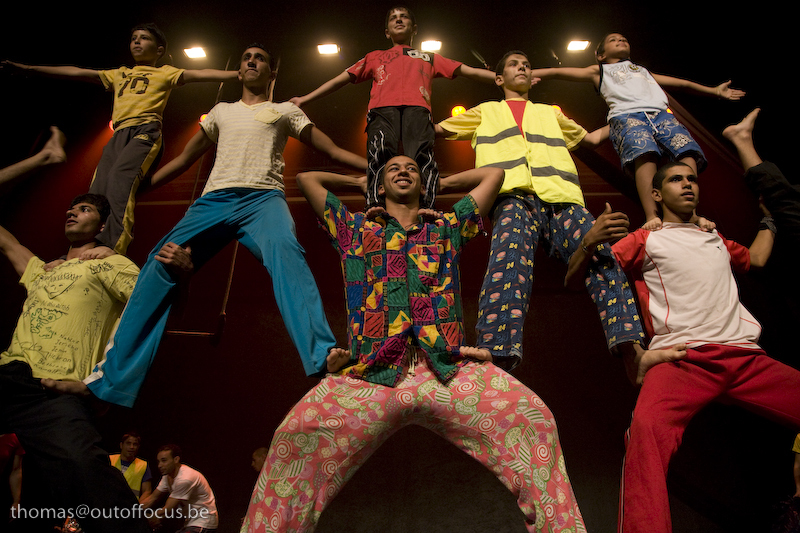 The School operates local circus clubs and gives performances in various cities, villages and refugee camps. 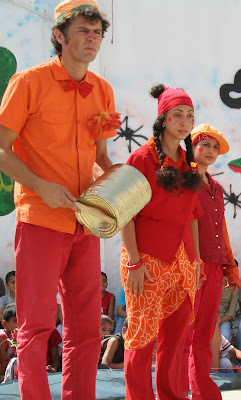 The Palestinian Circus School is a non-profit, non-governmental organization established in 2006 and registered with the Palestinian Authority since February 2007. You can read more and view some videos of their work at: www.palcircus.ps. 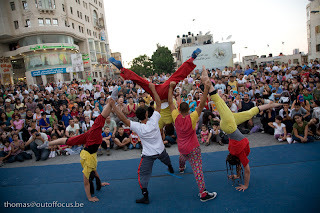 My consulting firm, which mainly serves the private sector, was commissioned by a unique donor, the Drosos Foundation, to assist the Palestinian Circus School in developing a five-year business plan which we successfully completed. Drosos has a rock solid motto of being ‘committed to enabling disadvantaged people to live a life of dignity.’ It is rare I would choose to write about one of my work assignments; however, what I witnessed over several months sparked an interest that I want to share. I also want to appeal to you to support their efforts. Likewise, Palestine is flooded with donor agencies, and most want to drive Palestinians’ development agenda, so when I worked with a funding agency that was sincere about supporting Palestinians by providing resources, but didn’t stand in the way of indigenous planning, I felt this was one of those cases that is the exception and also deserves to be shared. Contemporary circus (or nouveau cirque as it was originally known in French-speaking countries) is a genre of performing art developed in the late 20th century, in which a story or theme is conveyed through traditional circus skills. It may all look like a game to the untrained eye, but this is serious business. At its heart, this style of circus is a societal change agent. 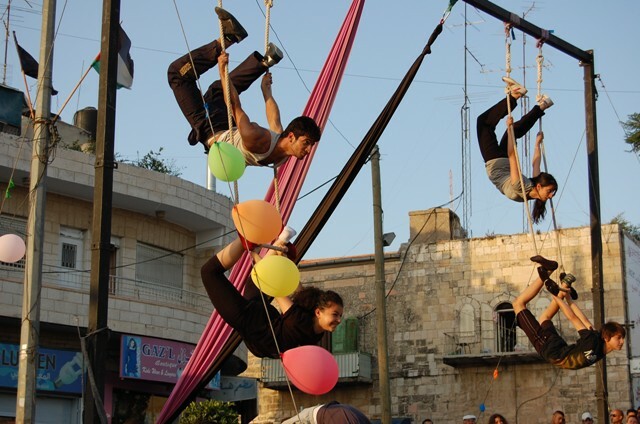 The Circus School teaches young Palestinians the circus pedagogy to stimulate and develop their physical, mental, artistic, emotional, social and cognitive abilities. The circus then employs these skills in bringing smiles to the faces of children throughout Palestine, especially in marginalized areas. If you spend any time in any part of Palestine, or even in Palestinian refugee communities outside of Palestine, you will quickly notice that the ultimate weight of this conflict is falling on the shoulders of our youngsters—shoulders that should never have to carry the weight of a military occupation! These young minds continue to be systematically damaged, but society is not standing still. The Palestinian Circus School puts smiles on children’s faces as well as using the platform of circus to link to a global circus arts community. Circus schools and troupes worldwide are acting in solidarity with Palestinians by exchanging trainers, performances and experiences. It’s serious business with serious results. Maybe that’s why, last year, Israeli authorities denied entry to Mr. Ivan Prado, the most famous clown in Spain, who was coming to perform to Palestinian audiences. Robert Sugarman, author of The Many Worlds of Circus, described the impact of circus best when he wrote, “By turning you upside down, we teach you to stand on your own two feet. By dropping objects we teach you to catch them. By having you walk all over someone, we teach you to take care of them. By having you clown around, we teach you to take yourself seriously.” The children of Palestine have had their lives turned upside down. Help us bring a smile to their faces and build confidence in their futures to make their lives worth living. - IndieGoGo Campaign to raise $25,000 to kick off fundraising for erecting a movable training hanger, which will be located adjacent to the newly donated headquarters. This new addition will house the high circus equipment, which are now placed outside in the cold under the open sky. This campaign just started and will run through February 20, 2012 at: http://igg.me/p/52303. - Alternatively, donations to the Palestinian Circus School in the U.S. can be made through The Middle East Children's Alliance (MECA is a tax-exempt 501(c) 3 organization, so your gift is tax-deductible) www.mecaforpeace.org/partners/palestinian-circus-school. - Of course, direct donations and/or student scholarships can be made via the School’s website at home.palcircus.ps/en/1/1/3. - Sam Bahour is a Palestinian-American business development consultant from Youngstown, Ohio living in the Palestinian City of Al-Bireh in the West Bank. He is co-author of HOMELAND: Oral Histories of Palestine and Palestinians (1994) and may be reached at sbahour@palnet.com. Disclosure: Sam’s firm, www.aim.ps, provides consulting services to PCS. NOTE: Walid Abu Rass is still being held! Israeli Occupying Forces (IOF) have arrested nearly 470 Palestinians since 18 October 2011 , when 477 Palestinian political prisoners were released in exchange for captured Israeli soldier Gilad Shalit as part of the first phase of the prisoner exchange deal concluded by the Israeli government and Hamas authorities. This wave of arrests reveals that the exchange deal has not deterred Israel’s policy of detention of Palestinians; rather, Israeli prisons are being refilled with almost the exact number of Palestinians that were released in October. Even the released prisoners were not safe from harassment, as the IOF has regularly raided their homes, issued summons to meet with Israeli intelligence and re-arrested one individual. The 470 Palestinians who were arrested between 18 October and 12 December include about 70 children and 11 women. The IOF continued to employ brutal methods of arrest, including the use of undercover Israeli forces, commonly known as musta’arabeen, who dress as Palestinian civilians in order to carry out ambushes and arrests of Palestinians from their homes and places of work. In many cases, joint army and intelligence raids occurred after midnight, where soldiers deliberately destroyed contents of the houses they were searching. Of the 70 children arrested during this period, the majority are from Shuafat camp in Jerusalem and Dheisheh camp in Bethlehem. In the past two weeks alone, 11 children were arrested in Shuafat and 10 in Dheisheh. Two of the 11 women arrested in during the past two months remain in detention. One of the released women is Irsa Salhab, a journalist who spent more than 20 days in Moskobiyyeh interrogation center. Six of the women were arrested during a demonstration outside Hasharon prison, where they were calling for the release of female prisoners not included in the first phase of the prisoner exchange. Three of these women were released shortly after their arrest, and three were sentenced to house arrest. Political activists were especially targeted for arrest during this period. Approximately 150 arrests of alleged party members occurred, particularly including those whom the IOF claims are active in the Popular Front for the Liberation of Palestine (PFLP), some of whom received indictments issued against them, while others received administrative detention orders. The IOF has continued to arrest and renew administrative detention orders of members of the Palestinian Legislative Council (PLC). Two PLC members were arrested since 18 October, the administrative detention orders of 6 PLC members were renewed and one PLC member received a 30-year sentence. Furthermore, on 27 October, following a mass hunger strike protesting punitive measures against prisoners including the use of isolation, the Israeli Prison Service (IPS) renewed the isolation order for Ahmad Sa’adat for another year. At the beginning of December, Ahmad entered his 34th consecutive month in isolation. The IOF also continued to carry out arrests against human rights defenders in order to further repress the popular resistance movement. During the past two months, arrests of protestors participating in peaceful demonstrations occurred in almost all of the villages with an active weekly demonstration. These arrests include at least 2 from Bil’in, 3 from Nabi Saleh, 17 from Beit Ummar, 3 from Al-Ma’asara, 1 from Kufr Qaddum and 2 from Al-Walajeh, with arrests in East Jerusalem and the South Hebron Hills as well. In addition to these arrests, the IOF used extreme violence to disperse demonstrations, resulting in the death of protestor Mustafa Tamimi, 28, on 10 December. Mustafa was fatally injured when hit by a teargas canister in the head fired at close range by an Israeli soldier on 9 December, during the weekly demonstration against the Israeli settlements and Annexation Wall in Nabi Saleh. The arrests of human rights defenders, use of violence against peaceful protestors and threats to family members of activists are in clear violation of Palestinians’ right to freedom of expression and assembly. In light of this heightened wave of arrests, Addameer is concerned about what will happen after the conclusion of the second phase of the prisoner exchange deal. The IPS has announced that 550 prisoners will be released on Sunday 18 December. Addameer calls for the implementation of the rights of released prisoners and urges the international community, including the United Nations and European Union, to intervene rapidly to prevent Israel from its continued practice of brutal and arbitrary detention. The Health Work Committees association is registered as a not-for profit organization with the Palestinian Ministry of the Interior and also has a Jerusalem registration since they work in Jerusalem as well. HWC employees over 300 persons and operates 14 clinics throughout the West Bank, providing primary health services via these health clinics, mostly in areas not fully covered by the Ministry of Health. HWC also has a community development aspect of their work and operate the following: Jadal Center for Culture and Social Development, Nidal Center (providing health education to East Jerusalem schools), Community Development Plan, Oasis Rehab Center, Community Based Rehabilitation, and the Elderly Care Nursery and Kindergarten. One of the success stories of HWC is its partnership with the Dunya Women's Cancer Clinic. - Sam Bahour is a Palestinian-American business consultant from Youngstown living in the Palestinian city of Al-Bireh in the West Bank. He is co-author of “Homeland: Oral Histories of Palestine and Palestinians” (1994) and may be reached via www.ePalestine.ps. The Myth of "Resuming Negotiations"
NOTE: Nurit Peled-Elhanan is a Professor of language and education at the Hebrew University of Jerusalem, an Israeli peace activist, and one of the founders of the Bereaved Families for Peace. After the death of Elhanan's 13 year-old daughter in a 1997 suicide bombing, she became an outspoken critic of the Israeli occupation of the West Bank and Gaza.